The major high energy physics experiments of the next twenty years will break new ground in our understanding of the fundamental interactions, structures and symmetries that govern the nature of matter and space-time. Among the principal goals are to find the mechanism responsible for mass in the universe, and the “Higgs” particles associated with mass generation, as well as the fundamental mechanism that led to the predominance of matter over antimatter in the observable cosmos. The largest collaborations today, such as CMS [] and ATLAS [] who are building experiments for CERN’s Large Hadron Collider (LHC) program [], each encompass 2000 physicists from 150 institutions in more than 30 countries. Each of these collaborations include 300-400 physicists in the US, from more than 30 universities, as well as the major US HEP laboratories. The current generation of operational experiments at SLAC (BaBar []) and Fermilab (D0 [] and CDF []), as well as the experiments at the Relativistic Heavy Ion Collider (RHIC) program at BNL [], face similar challenges. BaBar in particular has already accumulated datasets approaching a Petabyte (1 PB = 1015 Bytes). Collaborations on this global scale would not have been attempted if the physicists could not plan on excellent networks: to interconnect the physics groups throughout the lifecycle of the experiment, and to make possible the construction of Data Grids capable of providing access, processing and analysis of massive datasets. These datasets will increase in size from Petabytes to Exabytes (1 EB = 1018 Bytes) within the next decade. An impression of the complexity of the LHC data can be gained from Figure 1, which shows simulated particle trajectories in the inner “tracking” detectors of CMS. The particles are produced in proton-proton collisions that result from the crossing of two proton bunches. A rare proton-proton interaction (approximately 1 in 1013) resulting in the production of a Higgs particle that decays into the distinctive signature of four muons, is buried in 30 other “background” interactions produced in the same crossing, as shown in the upper half of the figure. The CMS software has to filter out the background interactions by isolating the point of origin of the high momentum tracks in the interaction containing the Higgs. This filtering produces the clean configuration shown in the bottom half of the figure. At this point, the (invariant) mass of the Higgs can be measured from the shapes of the four muons tracks (colored green) which are its decay products. Figure 1 A simulated decay of the Higgs Boson into four Muons. The lower picture shows the high momentum charged particles in the Higgs event . The upper picture shows how the event would actually appear in the detector, submerged beneath many other “background” interactions. · Providing rapid access to data subsets drawn from massive data stores, rising from Petabytes in 2002 to ~100 Petabytes by 2007, and Exabytes (1018 bytes) by approximately 2012 to 2015. The LHC experiments have thus adopted the “Data Grid Hierarchy” model (developed by the MONARC project) shown schematically in the figure below. This five-tiered model shows data at the experiment being stored at the rate of 100 – 1500 Mbytes/sec throughout the year, resulting in many Petabytes per year of stored and processed binary data, which are accessed and processed repeatedly by the worldwide collaborations searching for new physics processes. Following initial processing and storage at the “Tier0” facility at the CERN laboratory site, the processed data is distributed over high speed networks to ~10-20 national “Tier1” centers in the USA, leading European countries, Japan, and elsewhere. The data is there further processed and analyzed and then stored at approximately 60 “Tier2” regional centers, each serving a small to medium-sized country, or one region of a larger country (as in the US, UK and Italy). Data subsets are accessed and further analyzed by physics groups using one of hundreds of “Tier3” workgroup servers and/or thousands of “Tier4” desktops. The successful use of this global ensemble of systems to meet the experiments’ scientific goals depends on the development of Data Grids capable of managing and marshalling the “Tier-N” resources, and supporting collaborative software development by groups of varying sizes spread around the globe. The modes of usage and prioritization of tasks need to ensure that the physicists’ requests for data and processed results are handled within a reasonable turnaround time, while at the same time the collaborations’ resources are used efficiently. The GriPhyN [], PPDG [], iVDGL [], EU Datagrid [], DataTAG [], the LHC Computing Grid [] and national Grid projects in Europe and Asia are working together, in multi-year R&D programs, to develop the necessary Grid systems. The DataTAG project is also working to address some of the network R&D issues and to establish a transatlantic testbed to help ensure that the US and European Grid systems interoperate smoothly. Figure 2 The LHC Data Grid Hierarchy model. This was first proposed by the MONARC Collaboration in 1999. The data rates and network bandwidths shown in Figure 2 are per LHC experiment, for the first year of LHC operation. The numbers shown correspond to a conservative “baseline”, formulated using a 1999-2000 evolutionary view of the advance of network technologies over the next five years []. The reason for this is that the underlying “Computing Model” used for the LHC program assumes a very well-ordered, group-oriented and carefully scheduled approach to data transfers supporting the production processing and analysis of data samples. More general models supporting more extensive access to data samples on demand [] would clearly lead to substantially larger bandwidth requirements. It was widely recognized from the outset of planning for the LHC Experiments, that the computing systems required to collect, analyze and store the physics data would need to be distributed and global in scope. In the mid-1990s, when planning for the LHC computing systems began, calculations of the expected data rates, the accumulated yearly volumes, and the required processing power, led many to believe that HEP would need a system whose features would not have looked out of place in a science fiction novel. However, careful extrapolations of technology trend lines, and detailed studies of the computing industry and its expected development [] encouraged the Experiments that a suitable system could be designed and built in time for the first operation of the LHC collider in 2005. In particular, the studies showed that utilizing computing resources external to CERN, at the collaborating institutes (as had been done on a limited scale for the LEP experiments) would continue to be an essential strategy, and that a global computing system architecture would need to be developed. (It is worthwhile noting that, at that time, the Grid was at an embryonic stage of development, and certainly not a concept the Experiments were aware of.) Accordingly, work began in each of the LHC Experiments on formulating plans and models for how the computing could be done. The CMS Experiment’s “Computing Technical Proposal”, written in 1996, is a good example of the thinking that prevailed at that time. Because the computing challenges were considered so severe, several projects were instigated by the Experiments to explore various aspects of the field. These projects included RD45 [], GIOD, MONARC and ALDAP, as discussed in the following sections. the resources devoted to achieving 1 and 2 should be used as efficiently as possible. It is thus evident that the concept of a globally distributed computing and data-serving system for CMS was already firmly on the table in 1996. The proponents of the model had already begun to address the questions of computing “on demand”, replication of data in the global system, and the implications of distributing computation on behalf of end user physicists. Some years later, CMS undertook a major requirements and consensus building effort to modernize this vision of a distributed computing model to a Grid-based computing infrastructure. Accordingly, the current vision sees CMS computing as an activity that is performed on the “CMS Data Grid System” whose properties have been described in considerable detail []. The CMS Data Grid System specifies a division of labor between the Grid projects (described in this Chapter) and the CMS core computing project. Indeed, the CMS Data Grid System is recognized as being one of the most detailed and complete visions of the use of Grid technology among the LHC experiments. Project  was designed to address the key issues of wide area network-distributed data access and analysis for the LHC experiments. It was spurred by the advent of network-distributed Object Database Management Systems, whose architecture held the promise of being scalable up to the multi-Petabyte range required by the LHC experiments. GIOD was set up to leverage the availability of a large (200,000 MIP) HP Exemplar supercomputer, and other computing and data handling systems at CACR as of mid-1997. It addressed the fundamental need in the HEP community at that time to prototype Object Oriented software, databases and mass storage systems, which were at the heart of the LHC and other (e.g. BaBar) major experiments' data analysis plans. The project plan specified the use of high speed networks, including ESnet, and the transatlantic link managed by the Caltech HEP group, as well as next generation networks (CalREN2 in California and Internet2 nationwide) which subsequently came into operation with speeds approaching those to be used by HEP in the LHC era. The GIOD plan (formulated by Bunn and Newman in late 1996) was to develop an understanding of the characteristics, limitations, and strategies for efficient data access using the new technologies. A central element was the development of a prototype "Regional Center". This reflected the fact that both the CMS and ATLAS Computing Technical Proposals foresaw the use of a handful of such centers, in addition to the main center at CERN, with distributed database "federations" linked across national and international networks. Particular attention was to be paid to how the system software would manage the caching, clustering and movement of collections of physics objects between storage media and across networks. In order to ensure that the project would immediately benefit the physics goals of CMS and US CMS while carrying out its technical R&D, it also called for the use of the CACR computing and data storage systems to produce Terabyte samples of fully-simulated LHC signal and background events which were to be stored in the Object database. The GIOD project produced prototype database, reconstruction, analysis and visualization systems. This allowed the testing, validation and development of strategies and mechanisms that showed how the implementation of massive distributed systems for data access and analysis in support of the LHC physics program would be possible. Deployment and tests of the Terabyte-scale GIOD database were made at a few US universities and laboratories participating in the LHC program. In addition to providing a source of simulated events for evaluation of the design and discovery potential of the CMS experiment, the database system was used to explore and develop effective strategies for distributed data access and analysis at the LHC. These tests used local, regional, national and international backbones, and made initial explorations of how the distributed system worked, and which strategies were most effective. The GIOD Project terminated in 2000, its findings documented [], and was followed by several related projects described below. The MONARC project was set up in 1998 to model and study the worldwide-distributed Computing Models for the LHC experiments. This project studied and attempted to optimize the site architectures and distribution of jobs across a number of regional computing centres of different sizes and capacities, in particular larger Tier-1 centres, providing a full range of services, and smaller Tier-2 centres. The architecture developed by MONARC is described in the final report [] of the project. MONARC provided key information on the design and operation of the Computing Models for the experiments, who had envisaged systems involving many hundreds of physicists engaged in analysis at laboratories and universities around the world. The models encompassed a complex set of wide-area, regional and local-area networks, a heterogeneous set of compute- and data-servers, and an undetermined set of priorities for group-oriented and individuals' demands for remote data and compute resources. Distributed systems of the size and complexity envisaged did not yet exist, although systems of a similar size were predicted by MONARC to come into operation and be increasingly prevalent by around 2005. · providing an effective forum where representatives of actual and candidate Regional Centres may meet and develop common strategies for LHC Computing. In particular, the MONARC work led to the concept of a Regional Centre hierarchy, as shown in Figure 2, as the best candidate for a cost-effective and efficient means of facilitating access to the data and processing resources. The hierarchical layout was also believed to be well-adapted to meet local needs for support in developing and running the software, and carrying out the data analysis with an emphasis on the responsibilities and physics interests of the groups in each world region. In the later phases of the MONARC project, it was realised that computational Grids, extended to the data-intensive tasks and worldwide scale appropriate to the LHC, could be used and extended (as discussed in Section 9) to develop the workflow and resource management tools needed to effectively manage a worldwide-distributed “Data Grid” system for HEP. The NSF funded three-year ALDAP project (which terminated in 2002) concentrated on the data organization and architecture issues for efficient data processing and access for major experiments in HEP and astrophysics. ALDAP was a collaboration between Caltech, and the Sloan Digital Sky Survey (SDSS) teams at Johns Hopkins University and Fermilab. The goal was to find fast space- and time-efficient structures for storing large scientific data sets. The structures needed to efficiently use memory, disk, tape, local and wide area networks, being economical on storage capacity and network bandwidth. The Sloan Digital Sky Survey (SDSS) is digitally mapping about half of the northern sky in five filter bands from UV to the near IR. SDSS is one of the first large physics experiments to design an archival system to simplify the process of “data mining” and shield researchers from the need to interact directly with any underlying complex architecture. The need to access these data in a variety of ways requires it to be organized in a hierarchy and analyzed in multiple dimensions, tuned to the details of a given discipline. But the general principles are applicable to all fields. To optimize for speed and flexibility there needs to be a compromise between fully ordered (sequential) organization, and totally “anarchic”, random arrangements. To quickly access information from each of many “pages” of data, the pages must be arranged in a multidimensional mode in a neighborly fashion, with the information on each page stored judiciously in local clusters. These clusters themselves form a hierarchy of further clusters. These were the ideas that underpinned the ALDAP research work. Most of the ALDAP project goals were achieved. Besides them, the collaboration yielded several other indirect benefits. It led to further large collaborations, most notably when the ALDAP groups teamed up in three major successful ITR projects: GriPhyN, iVDGL and NVO. In addition, one of the ALDAP tasks undertaken won a prize in the Microsoft-sponsored student Web Services contest. The “SkyServer”[], built in collaboration with Microsoft as an experiment in presenting complex data to the wide public, continues to be highly successful, with over 4 million web hits in its first 10 months. In this section we introduce the major HEP Grid projects. Each of them has a different emphasis: PPDG is investigating short term infrastructure solutions to meet the mission-critical needs for both running particle physics experiments and those in active development (such as CMS and ATLAS). GriPhyN is concerned with longer-term R&D on Grid-based solutions for, collectively, Astronomy, Particle Physics and Gravity Wave Detectors. The iVDGL “international Virtual Data Grid Laboratory” will provide global testbeds and computing resources for those experiments. The EU DataGrid has similar goals to GriPhyN and iVDGL, and is funded by the European Union. LCG is a CERN-based collaboration focusing on Grid infrastructure and applications for the LHC experiments. Finally, CrossGrid is another EU-funded initiative that extends Grid work to eleven countries not included in the EU DataGrid. There are several other smaller Grid projects for HEP, which we do not cover here due to space limitations. The Particle Physics Data Grid (www.ppdg.net ) collaboration was formed in 1999 to address the need for Data Grid services to enable the worldwide distributed computing model of current and future high-energy and nuclear physics experiments. Initially funded from the Department of Energy’s NGI program and later from the MICS and HENP programs, it has provided an opportunity for early development of the Data Grid architecture as well as for the evaluation of some prototype Grid middleware. PPDG’s second round of funding is termed the Particle Physics Data Grid Collaboratory Pilot. This phase is concerned with developing, acquiring and delivering vitally needed Grid-enabled tools to satisfy the data-intensive requirements of particle and nuclear physics. Novel mechanisms and policies are being vertically integrated with Grid middleware and experiment-specific applications and computing resources to form effective end-to-end capabilities. As indicated in the diagram above, PPDG is a collaboration of computer scientists with a strong record in distributed computing and Grid technology, and physicists with leading roles in the software and network infrastructures for major high-energy and nuclear experiments. A three-year program has been outlined for the project that takes full advantage of the strong driving force provided by currently operating physics experiments, ongoing Computer Science projects and recent advances in Grid technology. The PPDG goals and plans are ultimately guided by the immediate, medium-term and longer-term needs and perspectives of the physics experiments, and by the research and development agenda of the CS projects involved in PPDG and other Grid-oriented efforts. Policy-driven request planning and scheduling of networked data and computational resources. Mechanisms are required for representing and enforcing both local and global policy constraints and new policy-aware resource discovery techniques. Management of transactions and task-execution across national-scale and worldwide virtual organizations. New mechanisms are needed to meet user requirements for performance, reliability, and cost. Agent computing will be important to permit the Grid to balance user requirements and grid throughput, with fault tolerance. Figure 4 A production Grid, as envisaged by GriPhyN, showing the strong integration of data generation, storage, computing and network facilities, together with tools for scheduling, management and security. The GriPhyN project is primarily focused on achieving the fundamental IT advances required to create Petascale Virtual Data Grids, but is also working on creating software systems for community use, and applying the technology to enable distributed, collaborative analysis of data. A multi-faceted, domain-independent Virtual Data Toolkit is being created and used to prototype the virtual data Grids, and to support the CMS, ATLAS, LIGO, and SDSS analysis tasks. The iVDGL “international Virtual Data Grid Laboratory” (http://www.ivdgl.org ) has been funded to provide a global computing resource for several leading international experiments in physics and astronomy. These experiments include the Laser Interferometer Gravitational-wave Observatory (LIGO), the ATLAS and CMS experiments, the Sloan Digital Sky Survey (SDSS), and the National Virtual Observatory (NVO). For these projects the powerful global computing resources available through the iVDGL should enable new classes of data intensive algorithms that will lead to new scientific results. Other application groups affiliated with the NSF supercomputer centers and EU projects are also taking advantage of the iVDGL resources. Sites in Europe and the U.S. are, or soon will be, linked together by a multi-Gigabit per second transatlantic link funded by a companion project in Europe. Management of iVDGL is integrated with that of the GriPhyN Project. Indeed, the GriPhyN and PPDG projects are providing the basic R&D and software toolkits needed for iVDGL. The European Union DataGrid (see the next Section) is also a major participant and is contributing some basic technologies and tools. The iVDGL is based on the open Grid infrastructure provided by the Globus Toolkit and builds on other technologies such as the Condor resource management tools. As part of the iVDGL project, a Grid Operations Center (GOC) has been created. Global services and centralized monitoring, management, and support functions are being coordinated by the GOC, which is located at Indiana University, with technical effort provided by GOC staff, iVDGL site staff, and the CS support teams. The GOC operates iVDGL just as a NOC manages a network, providing a single, dedicated point of contact for iVDGL status, configuration, and management, and addressing overall robustness issues. The European DataGrid (eu-datagrid.web.cern.ch) is a project funded by the European Union with the aim of setting up a computational and data-intensive grid of resources for the analysis of data coming from scientific exploration. Next generation science will require co-ordinated resource sharing, collaborative processing and analysis of huge amounts of data produced and stored by many scientific laboratories belonging to several institutions. The main goal of the DataGrid initiative is to develop and test the technological infrastructure that will enable the implementation of scientific “collaboratories” where researchers and scientists will perform their activities regardless of geographical location. It will also allow interaction with colleagues from sites all over the world, as well as the sharing of data and instruments on a scale previously unattempted. The project is devising and developing scalable software solutions and testbeds in order to handle many PetaBytes of distributed data, tens of thousand of computing resources (processors, disks, etc. ), and thousands of simultaneous users from multiple research institutions. The DataGrid initiative is led by CERN, together with five other main partners and fifteen associated partners. The project brings together the following European leading research agencies: the European Space Agency (ESA), France's Centre National de la Recherche Scientifique (CNRS), Italy's Istituto Nazionale di Fisica Nucleare (INFN), the Dutch National Institute for Nuclear Physics and High Energy Physics (NIKHEF) and the UK's Particle Physics and Astronomy Research Council (PPARC). The fifteen associated partners come from the Czech Republic, Finland, France, Germany, Hungary, Italy, the Netherlands, Spain, Sweden and the United Kingdom. DataGrid is an ambitious project. Its development benefits from many different kinds of technology and expertise. The project spans three years, from 2001 to 2003, with over 200 scientists and researchers involved. The DataGrid project is divided into twelve Work Packages distributed over four Working Groups: Testbed and Infrastructure, Applications, Computational & DataGrid Middleware, Management and Dissemination. The figure below illustrates the structure of the project and the interactions between the work packages. The job of CERN’s LHC Computing Grid Project (LCG – http://lhcgrid.web.cern.ch ) is to prepare the computing infrastructure for the simulation, processing and analysis of LHC data for all four of the LHC collaborations. This includes both the common infrastructure of libraries, tools and frameworks required to support the physics application software, and the development and deployment of the computing services needed to store and process the data, providing batch and interactive facilities for the worldwide community of physicists involved in the LHC. The first phase of the project, from 2002 through 2005, is concerned with the development of the application support environment and of common application elements, the development and prototyping of the computing services and the operation of a series of computing data challenges of increasing size and complexity to demonstrate the effectiveness of the software and computing models selected by the experiments. During this period there will be two series of important but different types of data challenge under way: computing data challenges that test out the application, system software, hardware and computing model, and physics data challenges aimed at generating data and analysing it to study the behaviour of the different elements of the detector and triggers. During this R&D phase the priority of the project is to support the computing data challenges, and to identify and resolve problems that may be encountered when the first LHC data arrives. The physics data challenges require a stable computing environment, and this requirement may conflict with the needs of the computing tests, but it is an important goal of the project to arrive rapidly at the point where stability of the grid prototype service is sufficiently good to absorb the resources that are available in Regional Centres and CERN for physics data challenges. This first phase will conclude with the production of a Computing System Technical Design Report, providing a blueprint for the computing services that will be required when the LHC accelerator begins production. This will include capacity and performance requirements, technical guidelines, costing models, and a construction schedule taking account of the anticipated luminosity and efficiency profile of the accelerator. Figure 6 The organizational structure of the LHC Computing Grid, showing links to external projects and industry. A second phase of the project is envisaged, from 2006 through 2008, to oversee the construction and operation of the initial LHC computing system. CrossGrid (http://www.crossgrid.org) is a European project developing, implementing and exploiting new Grid components for interactive compute- and data intensive applications such as simulation and visualisation for surgical procedures, flooding crisis team decision support systems, distributed data analysis in high energy physics, and air pollution combined with weather forecasting. The elaborated methodology, generic application architecture, programming environment, and new Grid services are being validated and tested on the CrossGrid testbed, with an emphasis on a user friendly environment. CrossGrid collaborates closely with the Global Grid Forum and the DataGrid project in order to profit from their results and experience, and to ensure full interoperability. The primary objective of CrossGrid is to further extend the Grid environment to a new category of applications of great practical importance. Eleven European countries are involved. The essential novelty of the CrossGrid project consists in extending the Grid to a completely new and socially important category of applications. The characteristic feature of these applications is the presence of a person in a processing loop, with a requirement for real-time response from the computer system. The chosen interactive applications are both compute- and data-intensive. In this section we take a look at how HEP experiments are currently making use of the Grid, by introducing a few topical examples of Grid-based architectures and applications. The beneficiary of NSF’s Distributed Terascale Facility (DTF) solicitation was the TeraGrid project (www.teragrid.org), a collaboration between Caltech, SDSC, NCSA and Argonne. The project is supplementing the already powerful PACI resources and services (e.g. the NPACI leading-edge site, SDSC, has the world’s largest HPSS-managed archive, with over 200 TB of storage) with much greater emphasis on providing access to large scientific data collections. Massive compute power (13.6 TFLOPS), very large data caches (450 Terabytes), expanded archival storage activities (HPSS), distributed visualization, ultra high-speed network connections among selected sites are features of the prototype. TeraGrid is strongly supported by the physics community participating in the LHC, through the the PPDG, GriPhyN and iVDGL projects, due to its massive computing capacity, leading edge network facilities, and planned partnerships with distributed systems in Europe. Figure 8 Showing the Grid-based Production of Monte Carlo data for the CMS experiment. 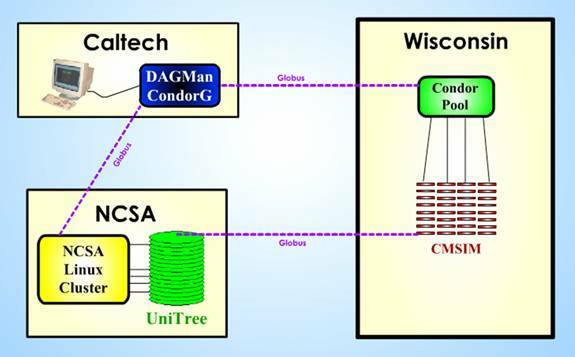 The setup, distributed between Caltech, Wisconsin and NCSA, was an early demonstrator of the success of Grid infrastructure for HEP computing. 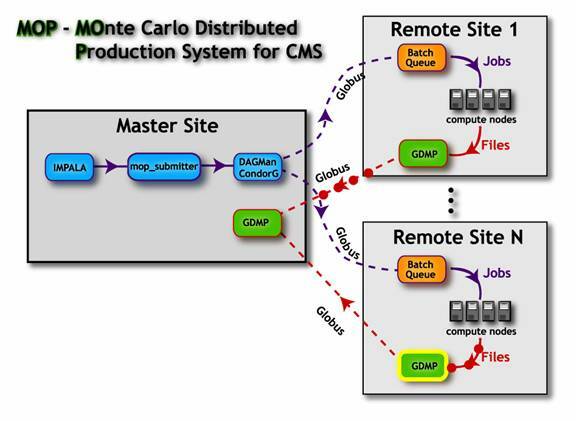 The MOP (short for “CMS Monte Carlo Production”) system was designed to provide the CMS experiment with a means for distributing large numbers of simulation tasks between many of the collaborating institutes. The MOP system comprises task description, task distribution and file collection software layers. The GDMP system (a Grid-based file copy and replica management scheme using the Globus toolkit) is an integral component of MOP, as is the Globus Replica Catalogue. Globus software is also used for task distribution. The task scheduler is the “Gridified” version of the Condor scheduler, Condor-G. In addition, MOP includes a set of powerful task control scripts developed at FermiLab. Figure 9 The MOP System, as demonstrated at SuperComputing 2001. In this schematic are shown the software components, and the locations at which they execute. Of particular note is the use of the GDMP Grid tool. The MOP development goal was to demonstrate that coordination of geographically distributed system resources for production was possible using Grid software. Along the way, the development and refinement of MOP aided the experiment in evaluating the suitability, advantages and shortcomings of various Grid tools. MOP developments to support future productions of simulated events at US institutions in CMS are currently underway. GRAPPA is an acronym for Grid Access Portal for Physics Applications. The preliminary goal of this project in the ATLAS experiment was to provide a simple point of access to Grid resources on the U.S. ATLAS Testbed. GRAPPA is based on the use of a Grid-enabled portal for physics client applications. An initial portal prototype developed at the Extreme! Computing Laboratory at Indiana University was the XCAT Science Portal (shown in the Figure below) which provided a script-based approach for building Grid Portals. This allowed users to build personal Grid Portals and was demonstrated with several applications. The ATLAS analysis and control framework, Athena, was used as the target application. The GRAPPA user authenticates to the portal using a GSI credential; a proxy credential is then stored so that the portal can perform actions on behalf of the user (such as authenticating jobs to a remote compute resource). The user can access any number of active notebooks within their notebook database. An active notebook encapsulates a session and consists of HTML pages describing the application, forms specifying the job's configuration, and Java Python scripts for controlling and managing the execution of the application. These scripts interface to Globus services in the GriPhyN Virtual Data Toolkit and have interfaces following the Common Component Architecture (CCA) Forum's specifications. This allows them to interact with and be used in high-performance computation and communications frameworks such as Athena. Using the XCAT Science Portal tools, GRAPPA is able to use Globus credentials to perform remote task execution, store user's parameters for re-use or later modification, and run the ATLAS Monte Carlo simulation and reconstruction programs. Input file staging and collection of output files from remote sites is handled by GRAPPA. Produced files are registered in a replica catalog provided by the Particle Physics Data Grid product MAGDA, developed at Brookhaven National Laboratory. Job monitoring features include summary reports obtained from requests to the Globus Resource Allocation Manager (GRAM). Metadata from job sessions are captured to describe dataset attributes using the MAGDA catalog. The D0 experiment’s data and job management system software, SAM, is an operational prototype of many of the concepts being developed for Grid computing. The D0 data handling system, SAM, was built for the “virtual organization”, D0, consisting of 500 physicists from 72 institutions in 18 countries. Its purpose is to provide a worldwide system of shareable computing and storage resources that can be brought to bear on the common problem of extracting physics results from about a Petabyte of measured and simulated data. The goal of the system is to provide a large degree of transparency to the user who makes requests for datasets (collections) of relevant data and submits jobs that execute Monte Carlo simulation, reconstruction or analysis programs on available computing resources. Transparency in storage and delivery of data is currently in a more advanced state than transparency in the submission of jobs. Programs executed, in the context of SAM, transform data by consuming data file(s) and producing resultant data file(s) of different content i.e. in a different “data tier”. Data files are read-only and are never modified, or versioned. The widespread adoption by the HEP community of Grid technology is a measure of its applicability and suitability for the computing models adopted and/or planned by HEP experiments. With this adoption there arose a pressing need for some sort of coordination between all the parties concerned with developing Grid infrastructure and applications. Without coordination, there was a real danger that a Grid deployed in one country, or by one experiment, might not interoperate with its counterpart elsewhere. Hints of this danger were initially most visible in the area of conflicting authentication and security certificate granting methods and the emergence of several incompatible certificate granting authorities. To address and resolve such issues, to avoid future problems, and to proceed towards a mutual knowledge of the various Grid efforts underway in the HEP community, several inter-Grid coordination bodies have been created. These organizations are now fostering multidisciplinary and global collaboration on Grid research and development. A few of the coordinating organizations are described below. The DataGrid, GriPhyN, iVDGL and PPDG, as well as the national European Grid projects in UK, Italy, Netherlands and France agreed to coordinate their efforts to design, develop and deploy a consistent open source standards-based global Grid infrastructure. The coordination body is HICB. The consortia developing Grid systems for current and next generation high energy and nuclear physics experiments, as well as applications in the earth sciences and biology, recognized that close collaboration and joint development is necessary in order to meet their mutual scientific and technical goals. A framework of joint technical development and coordinated management is therefore required to ensure that the systems developed will interoperate seamlessly to meet the needs of the experiments, and that no significant divergences preventing this interoperation will arise in their architecture or implementation. The HICB is thus concerned with ensuring compatibility and interoperability of Grid tools, interfaces and APIs, and organizing task forces, reviews and reporting on specific issues such as networking, architecture, security, and common projects. · tasks to help experiments with their intercontinental grid deployment and operational issues; establishment of policies and procedures related to interoperability; etc. Since the initial proposal for the GLUE project the LCG Project Execution Board and SC2 have endorsed the effort as bringing benefit to the project goals of deploying and supporting global production Grids for the LHC experiments. b) Ensuring that the EU DataGrid and GriPhyN/PPDG Grid infrastructure will be able to be configured as a single interoperable Grid for demonstrations and ultimately application use. c) Experiments will be invited to join the collaboration to build and test their applications with the GLUE suite. GLUE will work with grid projects to encourage experiments to build their grids using the common grid software components. The main objective of the DataTAG (www.datatag.org) project is to create a large-scale intercontinental Grid testbed involving the EU DataGrid project, several national projects in Europe, and related Grid projects in the USA. This will allow the exploration of advanced networking technologies and interoperability issues between different Grid domains..
DataTAG aims to enhance the EU programme of development of Grid enabled technologies through research and development in the sectors relevant to interoperation of Grid domains on a global scale. In fact, a main goal is the implementation of an experimental network infrastructure for a truly high-speed interconnection between individual Grid domains in Europe and in the US, to be shared with a number of EU projects. However, the availability of a high-speed infrastructure is not sufficient, so DataTAG is proposing to explore some forefront research topics such as the design and implementation of advanced network services for guaranteed traffic delivery, transport protocol optimisation, efficiency and reliability of network resource utilization, user-perceived application performance, middleware interoperability in multi domain scenarios, and so on. The DataTAG project is thus creating a large-scale intercontinental Grid testbed that will link the Grid domains. This testbed is allowing the project to address and solve the problems encountered in the high performance networking sector, and the interoperation of middleware services in the context of large scale data intensive applications. The Global Grid Forum (GGF – http://www.gridforum.org ) is a group of individuals engaged in research, development, deployment, and support activities related to Grids in general. The GGF is divided into working groups tasked with investigating a range of research topics related to distributed systems, best practices for the design and interoperation of distributed systems, and recommendations regarding the implementation of Grid software. Some GGF working groups have evolved to function as sets of related subgroups, each addressing a particular topic within the scope of the working group. Other GGF working groups have operated with a wider scope, surveying a broad range of related topics and focusing on long-term research issues. This situation has resulted in a different set of objectives, appropriate expectations, and operating styles across the various GGF working groups. Figure 12 Global Grid Forum working groups, as defined in 2001. 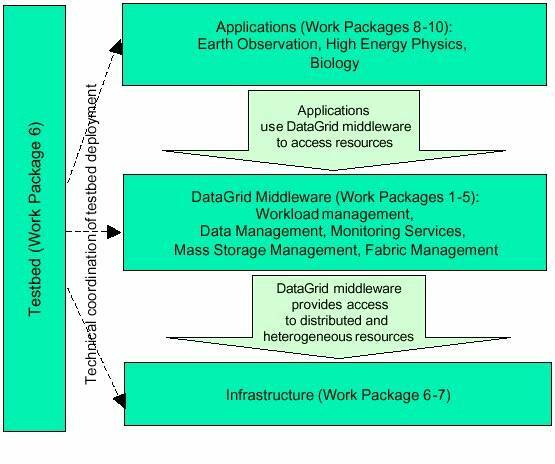 This section summarizes a number of critical issues and approaches that apply to the most data-intensive and/or extensive Grids, such as those being constructed and used by the major HEP experiments. While some of these factors appear to be special to HEP now (in 2002), it is considered likely that the development of Petabyte-scale managed Grids with high performance for data access, processing and delivery will have broad application within and beyond the bounds of scientific research in the next decade. It should be noted that several of the Grid projects mentioned above, notably PPDG, iVDGL and DataTAG, are designed to address the issue of deploying and testing vertically integrated systems serving the major experiments. These projects are thus suitable testing grounds for developing the complex, managed Grid systems described in this section. The nature of HEP Grids, involving processing and/or handling of complex Terabyte-to-Petabyte subsamples drawn from multi-Petabyte data stores, and many thousands of requests per day posed by individuals, small and large workgroups located around the world, raises a number of operational issues that do not appear in most of the Grid systems currently in operation or conceived. While the ensemble of computational, data-handling and network resources foreseen is large by present-day standards, it is going to be limited compared to the potential demands of the physics user community. Many large tasks will be difficult to service, as they will require the co-scheduling of storage, computing and networking resources over hours and possibly days. This raises the prospect of task-redirection, checkpointing/resumption, and perhaps task re-execution on a substantial scale. The tradeoff between high levels of utilization and turnaround time for individual tasks thus will have to be actively pursued, and optimized with new algorithms adapted to increasingly complex situations, including an expanding set of failure modes if demands continue to outstrip the resources. Each physics collaboration, large as it is, has a well defined management structure with lines of authority and responsibility. Scheduling of resources and the relative priority among competing tasks becomes a matter of policy rather than moment-to-moment technical capability alone. The performance (efficiency of resource use; turnaround time) in completing the assigned range of tasks, and especially the weekly, monthly and annual partitioning of resource usage among tasks at different levels of priority must be tracked, and matched to the policy by steering the system as a whole. There will also be site-dependent policies on the use of resources at each facility, negotiated in advance between each site-facility and the Collaboration and Laboratory managements. These local and regional policies need to be taken into account in any of the instantaneous decisions taken as to where a task will run, and in setting its instantaneous priority. So the net result is that the system’s assignment of priorities and decisions will be both inherently time-dependent and location-dependent. The relatively limited resources (compared to the potential demand) also leads to the potential for long queues, and to the need for strategic as well as tactical planning of resource allocations and task execution. The overall state of the complex system of site-facilities and networks needs to be monitored in real time, tracked, and sometimes steered (to some degree). As some tasks or classes of tasks will take a long time to complete, long decision processes (hours to days) must be carried out. A strategic view of workload also has to be maintained, in which even the longest and lowest (initial) priority tasks are completed in a finite time. For complex, constrained distributed systems of this kind, simulation and prototyping has a key role in the design, trial and development of effective management strategies, and for constructing and verifying the effectiveness and robustness of the Grid services themselves (see Section 8.5). In contrast, most current Grid implementations and concepts have implicit assumptions of resource-richness. Transactions (request/handling/delivery of results) are assumed to be relatively short, the probability of success relatively high, and the failure modes and the remedial actions required relatively simple. This results in the “classical” Grid (even if it involves some data) being a relatively simple system with little internal state, and simple scaling properties. The services to be built to successfully operate such a system are themselves relatively simple, since difficult (strategic) decisions in the scheduling and use of resources, and in the recovery from failure or the redirection of work away from a “hot spot”, rarely arise. The highest layer below the Applications layer specified in the current standard Grid architecture is the Collective layer, that “contains protocols and services (and APIs and SDKs) that are not associated with any one specific resource but rather are global in nature and capture interactions across collections of resources. … Collective components … can implement a wide variety of sharing behaviors without placing new requirements on the resources being shared”. Examples include workload management systems and collaboration frameworks, workload management systems, and so on. Although the Collective layer includes some of the ideas required for effective operation with the experiments’ application software, it is currently only defined at a conceptual level. Moreover, as discussed in Section 10.2, physicists deal with object collections, rather than with flat files, and the storage, extraction and delivery of these collections often involves a database management system (DBMS). It therefore falls to the experiments, at least for the short and medium term, to do much of the vertical integration, and to provide many of the “End-to-end Global Managed Services” required to meet their needs. It is also important to note that the experiments’ code bases already contain hundreds of thousands to millions of lines of code, and users’ needs are supported by powerful frameworks [] or “problem solving environments” that assist the user in handling persistency, in loading libraries and setting loading and application parameters consistently, in launching jobs for software development and test, etc. Hence Grid services, to be effective, must be able to interface effectively to the existing frameworks, and to generalize their use for work across a heterogeneous ensemble of local, continental and transoceanic networks. The Global End-to-End System Services Layer consists of services that monitor and track all the subsystem components over long periods, monitor and in some cases try to optimize or improve system performance, as well as resolve problems or inefficiencies caused by contention for scarce resources. This layer is “self aware” to the extent that is continually checking how well the resource usage is matched to the policies, and attempting to steer the system by redirecting tasks and/or altering priorities as needed, while using adaptive learning methods (such as the Self-Organizing Neural Net described in Section 8.5) for optimization. The Grid Applications Layer refers to the parameters, metrics and in some cases the algorithms used in the End-to-End System Services layer. This allows each experiment to express policies relating to resource usage and other desired system behaviors, and such aspects as how tightly coupled the processing tasks of a given sub-community are to a given geographical region. The issues raised in Section 8.1 lead to a number of general architectural characteristics that are highly desirable, if not required, for the services composing an open scalable Grid system of global extent, able to fulfill HEP’s data-intensive needs. The system has to be dynamic, with software components designed to cooperate across networks and to communicate state changes throughout the system, end-to-end, in a short time. It must be modular and loosely coupled, with resilient autonomous and/or semi-autonomous service components that will continue to operate, and take appropriate action (individually and cooperatively) in the case other components fail or are isolated due to network failures. It must be adaptable and heuristic, able to add new services and/or reconfigure itself without disrupting the overall operation of the system, to deal with a variety of both normal and abnormal situations (often more complex than point failures) that are not known a priori in the early and middle stages of system design and development. It must be designed to inter-communicate, using standard protocols and de facto mechanisms where possible, so that it can be easily integrated while supporting a variety of legacy systems (adopted at some of the main sites for historical reasons or specific functional reasons). It must support a high degree of parallelism for ongoing tasks, so that as the system scales the service components are not overwhelmed by service requests. A prototype distributed services architecture with these characteristics is described in Section 9. Because of the scale of HEP experiments, they are usually executed as managed projects with milestones and deliverables well-specified at each stage. The developing Grid systems therefore also must serve and support the development of the reconstruction and simulation software, and as a consequence they must also support the vital studies of online filtering algorithms, detector performance and the expected physics discovery potential. These studies begin years in advance of the start-up of the accelerator and the experiment, and continue up to and into the operations phase. As a consequence, the development philosophy must be to deploy working vertically integrated systems, that are (to an increasing degree) production-ready, with increasing functionality at each development cycle. This development methodology is distinct, and may be at odds with, a “horizontal” mode of development (depending on the development schedule) which focuses on basic services in the lower layers of the architecture and works its way up. In order to mitigate these differences in development methods, some experiments (e.g. CMS) have adopted a procedure of “sideways migration”. Home-grown tools (scripts and applications; sometimes whole working environments) that provide timely and fully functional support for “productions” of simulated and reconstructed physics events, currently involving tens of Terabytes produced at 10-20 institutions are progressively integrated with standard services as they become available and are production-tested. The drive towards standardization is sometimes spurred on by the manpower-intensiveness of the home-grown tools and procedures. An example is the evolution from the MOP to a more integrated system employing a wide range of basic Grid services. As summarized in the introduction to this chapter, HEP requires high performance networks, with data volumes for large scale transfers rising from the 100 Gigabyte to the 100 Terabyte range (drawn from 100 Terabyte to 100 Petabyte data stores) over the next decade. This corresponds to throughput requirements for data flows across national and international networks rising from the 100 Mbps range now to the Gbps range within the next 2-3 years, and the 10 Gbps range within 4-6 years. These bandwidth estimates correspond to static data flows lasting hours, of which only a few could be supported (presumably with high priority) over the “baseline” networks currently foreseen. These requirements make HEP a driver of network needs, and make it strongly dependent on the support and rapid advance of the network infrastructures in the US (Internet2 [], ESNet [] and the Regional Networks []), Europe (GEANT [)], Japan (Super-SINET []), and across the Atlantic (StarLight []; the US-CERN Link Consortium and DataTAG []) and the Pacific (GTRN []). In some cases HEP has become a very active participant in the development and dissemination of information about state of the art networks. Developments include bbcp (“BaBar Copy”) [] and bbftp (“BaBar ftp”) [], the Caltech-DataTAG “Grid-TCP” project [] and the Caltech “Multi-Gbps TCP” project [], as well as monitoring systems in the Internet End-to-end Performance Monitoring (IEPM) project at SLAC []. The development and deployment of standard working methods aimed at high performance is covered in the Internet2 HENP (High Energy and Nuclear Physics) Working Group [], the Internet2 End-to-end Initiative [], and the ICFA Standing Committee on Inter-Regional Connectivity []. If one takes into account the time-dimension, and the fact that a reliable distributed system needs to have both task queues (including queues for network transfers) of limited length and a modest number of pending transactions at any one time, then the resulting bandwidth (and throughput) requirements are substantially higher than the baseline needs described above. We may assume, for example, that typical transactions are completed in 10 minutes or less, in order to avoid the inherently fragile state of the distributed system that would result if hundreds to thousands of requests were left pending for long periods, and to avoid the backlog resulting from tens and then hundreds of such “data-intensive” requests per day. A 100 Gigabyte transaction completed in 10 minutes corresponds to an average throughput of 1.3 Gbps, while a 1 Terabyte transaction in 10 minutes corresponds to 13 Gbps. http://webcc.in2p3.fr ) to CERN in Geneva. Beyond the simple requirement of bandwidth, HEP needs networks that interoperate seamlessly across multiple world regions and administrative domains. Until now the Grid services are (implicitly) assumed to run across networks that are able to provide transparent high performance (as above) as well as secure access. The particle physics-related Grid projects PPDG, GriPhyN/iVDGL, EU DataGrid, DataTAG and others are taking steps towards these goals. But the complexity of the networks HEP uses means that a high degree of awareness of the network properties, loads, and scheduled data flows will be needed to allow the Grid services to function as planned, and to succeed in scheduling the work (consisting of hundreds to thousands of tasks in progress at any point in time) effectively. Grid and network operations for HEP will therefore require an Operations Center (or an ensemble of centers) to gather and propagate information on the system status, problems and mitigating actions, assist in troubleshooting, and maintain a repository of guidelines and best practices for Grid use. One example is the iVDGL Grid Operations Center now under development at Indiana University (http://igoc.iu.edu). HEP data analysis is and will remain resource-constrained, and so large production teams, small workgroups and individuals all will often need to make strategic decisions on where and how to carry out their work. The decisions will have to take into account their quotas and levels of priority for running at each site, the likely time-delays incurred in running at a given site. Grid users will need to be provided with information (to the degree they are willing to deal with it) on the state of the various sites and networks, task queues with estimated times, data flows in progress and planned, problems and estimated time-to-repair if known. They will need to choose whether to run remotely, using centralized large scale resources, or regionally or even locally on their group’s servers or desktops, where they have more control and relatively greater rights to resource usage. The hope is that eventually many of these functions will be automated, using adaptive learning algorithms and intelligent software agents, to allow the physicists to concentrate on their own work rather than the internal workings of the Grid systems. But in (at least) the early stages, many of these decisions will have to be manual, and interactive. Since the basic strategies and guidelines for Grid users (and for the operational decisions to be taken by some of the Grid services in a multi-user environment) have yet to be developed, it is clear that Modeling and Simulation (M&S) will have a key role in the successful development of Grids for High Energy Physics. M&S is generally considered an essential step in the design, development and deployment of complex distributed systems in a wide range of fields [], from space missions to networks, from battlefields to agriculture and from the factory floor to microprocessor design. Yet such simulations, with an appropriately high degree of abstraction and focusing on the key component and distributed system behaviors (so that they can scale to very large and complex systems), have so far not been widely adopted in the HEP community or in the Grid projects. One such simulation system was developed in the MONARC project [] (http://monarc.web.cern.ch/MONARC/sim_tool/). This system was applied to regional center operations, to data replication strategies [], and to the optimization of job scheduling among several Regional Center sites using a Self-Organizing Neural Network (SONN) [], but it has yet to be applied directly to problem of designing and testing of a wide range of user- and service-strategies for HEP Grids. Such a series of studies, using this or a similar system, will be needed to (1) develop scalable Grid services of sufficient robustness, (2) formulate and then validate the architecture and design of effective Grid and decision-support services, as well as guidelines to be provided to users, and (3) determine the achievable level of automation in handling strategic scheduling, job placement, and resource co-scheduling decisions. Because the MONARC system is based on process-oriented discrete event simulation, it is well-adapted to real time operational support for running Grid systems. The system could be applied, for example, to receive monitoring information within a real operational Grid, and return evaluations of the estimated time to completion corresponding to different job placement and scheduling scenarios. A scalable agent-based Dynamic Distributed Server Architecture (DDSA), hosting loosely coupled dynamic services for HEP Grids has been developed at Caltech, that meets the general criteria outlined in Section 8.3. These systems are able to gather, disseminate and coordinate configuration, time-dependent state and other information across the Grid as a whole. 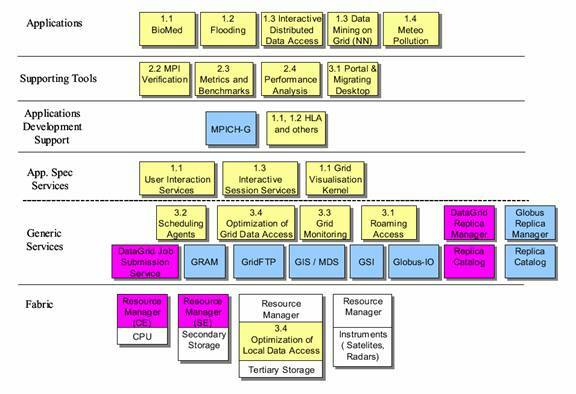 As discussed in this section, this architecture, and the services implemented within it, provide an effective enabling technology for the construction of workflow- and other forms of global higher level end-to-end Grid system management and optimization services (along the lines described in Section 8.2). A prototype distributed architecture based on JINI [] has been developed, with services written in Java. This has been applied to the development of a flexible realtime monitoring system for heterogeneous regional centers [] (described in the next section), and to the optimization of the interconnections among the “reflectors” making up Caltech’s Virtual Room Videoconferencing System (VRVS []) for worldwide collaboration. The prototype design is based on a set of “Station Servers” (generic network server units) dynamically interconnected (peer-to-peer) to form a distributed framework for hosting different types of services. The use of JINI distributed system support allows each Station Server to easily keep a dynamic list of active Station Servers at any moment in time. The prototype framework has been based on JINI because it allows cooperating services and applications to discover and to access each other seamlessly, to adapt to a dynamic environment, and to share code and configurations transparently. The system design avoids single points of failure, allows service replication and re-activation, and aims to offer reliable support for large scale distributed applications in real conditions, where individual (or multiple) components may fail. Dynamic Services are hosted by the framework of networked Station Servers and made available to interested clients. The framework allows each service to locate and access information from anywhere in the entire system, and to interact with other services. The Station Server does the service management and facilitates inter-service communication. Mobile Agents are dynamic autonomous services (with internal rules governing their behavior) which can move between Station Servers to perform one or more specified tasks. This transfer is done using a transaction management service, which provides a two phase commit and protects the integrity of the operation. Agents may interact synchronously or asynchronously using the Station Servers’ support for “roaming” and a messages mailbox. are flexible services which are deployed to the interested clients and services and act differently according to the rule base encountered at the destination, which includes a set of local and remote parameters. These types of components work together and interact by using remote event subscription/ notification and synchronous and asynchronous message-based communication. Code mobility is also required to provide this functionality in a scalable and manageable way. Leasing Mechanism: Access to many of the services in the JINI system environment is lease based. Each lease is negotiated between the user of the service and the provider of the service as part of the service protocol, for a specified time period. Remote Events: The JINI architecture supports distributed events. An object may allow other objects to register interest in events (changes of state) in the object and receive a notification of the occurrence of such an event. This enables distributed event-based programs to be written with a variety of reliability and scalability guarantees. Transactions Manager: Reliable distributed object models require transaction support to aid in protecting the integrity of the resource layer. The specified transactions are inherited from the JINI programming model and focus on supporting large numbers of heterogeneous resources, rather than a single large resource (e.g. a database). This service provides a series of operations, either within a single service or spanning multiple services, that can be wrapped in one transaction. The Mailbox Service: This service can be used to provide asynchronous communications (based on any type of messages) between distributed services. The interconnections among the Station Servers, and the mechanisms for service registration and notification that keep the Server framework updated, are shown schematically in Figure 11 below. Each Station Server registers itself to be a provider of one or more dynamic services with a set of JINI lookup-servers. As a result it receives the necessary code and parameter data (the yellow dots in the figure), downloaded from a JavaSpace. At the same time the Station Server subscribes as a remote listener, to be notified (through remote events) of state changes in any of the other Station Servers. This allows each Server to keep a dynamically updated list of active Station Servers, through the use of a proxy for each of the other Servers. The JINI lease mechanism is used to inform each unit of changes that occur in other services (or to alert the Servers of other changes, as in the case of network problems). Figure 13 Showing the interconnections and mechanisms for registration and notification in the DDSA Station Server framework. The use of dynamic remote event subscription allows a service to register to be notified of certain event types, even if there is no provider to do the notification at registration time. The lookup discovery service will then notify the Station Servers when a new provider service, or a new service attribute, becomes available. In large complex systems such as those foreseen for LHC, the services will be organized and clustered according to a flexible, somewhat-hierarchical structure. Higher level services that include optimization algorithms are used to provide decision-support, or automated decisions, as discussed in the next sections. As the information provider-services are distributed, the algorithms used for decisions also should be distributed: for the sake of efficiency, and to be able to cope with a wide variety of abnormal conditions (e.g. when one or more network links are down). As a simple example, we describe how the distributed Station Server framework may be used for job scheduling between Regional Centers. Each Center starts a Station Server, and the Server network is created through the mechanisms described earlier. Each Station Server registers for, and downloads code and a parameter set for a “Job Scheduling optimization” service. When a Regional Center (through its Station Server) considers exporting a job to another site it first sends out a call to (all or a designated subset of) the other Station Servers for “remote job estimation”, requesting that the time to complete the job at each designated site be provided by the Station Server (specifically by a job-execution estimation agent housed by the Server) at that site. The answers received within a set time window then are used to decide if and where to export the job for execution. In order to determine the optimal site to execute the job, a “thin proxy” is sent to each remote site. The Station Server there does an evaluation, using the characteristics of the job, the site configuration parameters, the present load and other state parameters of the local site. It may also use the historical “trajectory” of resource usage and other state variables, along with external information (such as the resource usage policies and priorities). The evaluation procedure may also use adaptive learning algorithms, such as a Self-Organizing Neural Network (SONN; introduced in Section 8.5). Having the evaluation done in parallel by each of the Station Servers has a performance advantage. The Server at each site also may have direct access to local monitoring systems that keep track of the available resources and queues, as well as access to local policy rules and possibly to more complex local systems managing job scheduling, based on detailed knowledge of the characteristics and history of each job. As the remote evaluations are completed, the results are returned to the original site that sent out the request. These results may be as simple as the time to complete the job, or as complex as a set of functions that give the “cost to complete” expressed in terms of the priority for the job (and the implied level of resource usage). The originating site then makes the final decision based on the information received, as well as its own “global” evaluation algorithms (such as another SONN). Once the decision on the (remote) site for execution has been made, the description object for the job is transferred to the remote site using a Transaction Manager and a progress job handle is returned. This provides the mechanisms for the originating site to control the job execution at a remote site and to monitor its progress (through the notification mechanism and/or explicit requests for information). A schematic view of a prototypical Job Scheduling Service using the DDSA is illustrated in Figure 14 below. Figure 14 Illustration of a basic job scheduling system based on the DDSA architecture. A prototype agent-based monitoring system MONALISA has been built using the DDSA architecture, based on JINI as well as WSDL and SOAP technologies. The system has been deployed and in its initial implementation is currently monitoring the prototype Regional Centers at Caltech, CERN, Fermilab, Florida, and Bucharest. The goal of MONALISA is to gather and disseminate real-time and historical monitoring information on the heterogeneous Regional Center site facilities and network links in an HEP Data Grid, and to deliver this information to a set of loosely coupled higher level services. As described in Sections 9.3 and 9.4, the higher level services may be targeted at managing and optimizing workflow though the Grid, or providing decision-support to users interactively. The monitoring system uses autonomous mobile agents and has built-in SNMP support. It is constructed to intercommunicate with any other monitoring system [], queuing system [] or procedure, in order to collect parameters describing the characteristics and state of computational nodes, storage management systems, databases, Web servers, and other site components, as well as the performance of network links to and within the site as a function of time. The data collection in MONALISA is based on dynamically loadable “Monitoring Modules” and a set of “Farm Monitors”, as illustrated in Figure 15. Figure 15 Data collection and processing in MONALISA. Farm Monitors use dynamically loadable Monitoring Modules to pull or push information from computational nodes or other elements at one or more sites. Each Farm Monitor unit is responsible for the configuration and the monitoring of one or several farms. It can dynamically load any monitoring modules from a (set of) Web servers (with http), or a distributed file system. The Farm Monitor then uses the modules to perform monitoring tasks on each node, based on the configuration it receives from a Regional Center Monitor unit (not shown) that controls a set of Farm Monitors. The multithreaded engine controlling a dynamic pool of threads shown in Figure 13 is used to run the specified monitoring modules concurrently on each node, while limiting the additional load on the system being monitored. Dedicated modules adapted to use parameters collected by other monitoring tools (e.g. Ganglia, MRTG) are controlled by the same engine. The use of multi-threading to control the execution of the modules also provides robust operation, since a monitoring task that fails or hangs (due to I/O errors for example) will not disrupt or delay the execution of the other modules. A dedicated control thread is used to stop any threads that encounter errors, and to reschedule the tasks associated with this thread if they have not already been successfully completed. A priority queue is used to handle the monitoring tasks that need to be executed periodically. A Monitoring Module is a dynamically loadable unit which executes a procedure (runs a script or a program, or makes an SNMP request) to monitor a set of values, and to correctly parse the results before reporting them back to the Farm Monitor. Each Monitoring Module must implement a method that provides the names (identifiers) for the parameters it monitors. Monitoring Modules can be used to pull data once, or with a given frequency. They may also push and install code at a monitored node (the dark dots at the right of the figure), after which they will autonomously push back the monitoring results (using SNMP, UDP or TCP) periodically back to the Farm Monitoring module. Dynamically loading the Monitoring Modules from a relatively small set of sites when they are needed, makes it much easier to keep large monitoring systems updated and able to provide the latest functionality in a timely manner. Figure 16. Each Farm Monitor registers as a JINI service and /or a WSDL service. Clients or other services get the needed system configuration information, and are notified automatically when a change in this information occurs. Clients subscribe as listeners to receive the values of monitored parameters (once or periodically; starting now or in the future; for real-time and/or historical data). The monitoring predicates are based on regular expressions for string selection, including configuration parameters (e.g. system names and parameters), conditions for returning values and time limits specifying when to start and stop monitoring. In addition predicates may perform elementary functions such as MIN, MAX, average, integral, etc. The predicate-matching and the client notification is done in independent threads (one per client IP address) under the control of the DataCache Service unit (shown in the figure). The measured values of monitored parameters are currently stored in a relational database using JDBC (such as InstantDB, MySQL, Postgres, Oracle, etc.) in order to maintain an historical record of the data. The predicates used to retrieve historical data are translated into SQL queries, which are then used to select the desired data from the database and deliver it to the client who made the query. The thread associated with the query remains active, and as soon as it receives additional data satisfying the predicates, it sends that data on (as an update) to the client. The system also allows one to add additional data writers and to provide the collected values to other programs or tools, through the use of user-defined dynamically loadable modules (shown at the bottom of the figure). Figure 16 Data flow and operation of the Farm Monitor unit in MONALISA. More complex data processing can be handled by Filter Agents (represented as the blue square in Figure 16). These agents are "active objects" which may be deployed by a client or another service to perform a dedicated task using the data collected by a Farm Monitor unit. Each agent uses a predicate to filter the data it receives, and it may send the computed values back to a set of registered Farm Monitor units. As an example, a maximum flow path algorithm can be performed by such an agent. Agents may perform such tasks without being deployed to a certain service, but in this case the Data Cache Service unit needs to send all the requested values to the remote sites where the units that subscribed to receive these values are located. The Farm Monitor unit is designed as a service system able to accept values, predicate-based requests from clients, and Agent Filters, and to manage all of them asynchronously. The Farm Monitor is then "published" as a JINI service and a WSDL service at the same time. An example of the monitoring system’s output is shown in Figure 17. In the upper left there is a real-time plot of the farms being monitored, indicating their loads (Green = low load; Pink = high load; Red = unresponsive node) and the bottleneck bandwidths (monitored using PING and the round trip time for different packet sizes) on each network path between them. The upper right plot shows a list of site components, in a hierarchical directory-like structure, at the selected site (CERN in this case). One can obtain detailed information about any site component’s configuration and status, drilling down through several levels in the directory structure if needed. (N = 5, 10, 15) using a sliding time-window. The bottom center plot shows the current CPU load for selected nodes in a sub-cluster of 50 nodes, averaged over the same three time-intervals. The bottom right plot shows the current bottleneck bandwidth between CERN and each of the other four sites being monitored. The monitored values in the plots are updated frequently in real time, as new measurements are performed and the results come in. Figure 17 Example output (screenshot) from the MONALISA monitoring system, running on farms at (left to right in the upper left plot) Caltech, Fermilab, Florida, CERN and Politechnica University in Bucharest. Until now, the Grid architecture being developed by the LHC experiments has focused on sets of files and on the relatively well-ordered large-scale production environment. Considerable effort is already being devoted to the preparation of Grid middleware and services (this work being done largely in the context of the PPDG, GriPhyN, EU DataGrid and LHC Computing Grid projects already described). However, in early 2002, the problem of how processed object collections, processing and data handling resources, and ultimately physics results may be obtained efficiently by global physics collaborations had yet to be tackled head on. Developing Grid-based tools to aid in solving this problem over the next few years, and hence beginning to understand new concepts and the foundations of the analysis solution, was deemed to be essential if the LHC experiments were to be ready for the start of LHC running. We have described how the prevailing view of the LHC Experiments’ computing and software models is well developed, being based on the use of the Grid to leverage and exploit a set of computing resources that are distributed around the globe at the collaborating institutes. Analysis environment prototypes based on modern software tools, chosen from both inside and outside High Energy Physics have been developed. These tools have been aimed at providing an excellent capability to perform all the standard data analysis tasks, and assumed full access to the data, very significant local computing resources, and a full local installation of the experiment’s software. These prototypes have been, and continue to be very successful; a large number of physicists use them to produce detailed physics simulations of the detector, and attempt to analyze large quantities of simulated data. However, with the advent of Grid computing, the size of the collaborations, and the expected scarcity of resources, there is a pressing need for software systems that manage resources, reduce duplication of effort, and aid physicists who need data, computing resources, and software installations, but who cannot have all they require locally installed. The development of an interactive Grid-enabled Analysis Environment (GAE) for physicists working on the LHC Experiments was thus proposed in 2002. In contrast to the production environment, which is typically operated by a small number of physicists dedicated to the task, the analysis environment needed to be portable, lightweight (yet highly functional), and make use of existing and future experimental analysis tools as plug-in components. It needed to consist of tools and utilities that exposed the Grid system functions, parameters and behavior at selectable levels of detail and complexity. It is believed that only by exposing this complexity can an intelligent user learn what is reasonable (and efficient for getting work done) in the highly constrained global system foreseen. The use of Web Services to expose the Grid in this way, will allow the physicist to interactively request a collection of analysis objects, to monitor the process of preparation and production of the collection and to provide “hints” or control parameters for the individual processes. The Grid enabled analysis environment will provide various types of feedback to the physicist, such as time to completion of a task, evaluation of the task complexity, diagnostics generated at the different stages of processing, real-time maps of the global system, and so on. A key challenge in the development of a Grid Enabled Analysis Environment for HENP is to develop suitable services for object collection identification, creation and selection. In order to complete an analysis a physicist needs access to data collections. Data structures and collections not available locally need to be identified. Those collections identified as remote or non-existent need to be produced and transferred to an accessible location. Collections that already exist need to be obtained using an optimized strategy. Identified computing and storage resources need to be matched with the desired data collections using available network resources. It is intended to use Web-based portals and Web Services to achieve this functionality, with features that include collection browsing within the Grid, enhanced job submission and interactive response times. Scheduling of object collection analysis activities, to make the most efficient use of resources, is especially challenging given the current ad hoc systems. Without Grid-integrated tools, scheduling cannot advance beyond the most basic scenarios (involving local resources or resources at one remote site). Accordingly, a set of tools to support the creation of more complex and efficient schedules and resource allocation plans is required. In the long term, the Grid projects intend to deliver advanced schedulers which can efficiently map many jobs to distributed resources. Currently this work is in the early research phase, and the first tools will focus on the comparatively simpler scheduling of large batch production jobs. Experience with using new scheduling tools should also help the ongoing development efforts for automatic schedulers. The GAE should consist of tools and utilities that expose the Grid system functions, parameters and behavior at selectable levels of detail and complexity. At the request submission level, an end-user might interact with the Grid to request a collection of analysis objects. At the progress monitoring level, an end-user would monitor the process of preparing and producing this collection. Finally at the control level, the end-user would provide “hints” or control parameters to the Grid for the production process itself. Within this interaction framework, the Grid would provide feedback on whether the request is “reasonable”, for example by estimating the time to complete a given task, showing the ongoing progress towards completion, and displaying key diagnostic information as required. This complexity must be visible to the user so that can s/he can learn what is reasonable in the highly constrained global Grid system. By using Web Services, it is ensured that the GAE is comparatively easy to deploy, regardless of the platform used by the end-user. It is important to preserve the full functionality of the GAE regardless of the end-user’s platform. The desire is for OS-neutrality, so allowing access from as wide a range of devices as possible. The GAE Web Services are integrated with other services such as agent-based monitoring services (as discussed in Section 9) and the Virtual Data Catalog Service. At Caltech, we have been developing a key component of the GAE toolset. The Clarens component software aims to build a wide-area network client/server system for remote access to a variety of data and analysis services. It does this by facilitating the integration of several existing HEP analysis and production tools, in a plug-in architecture which features an extremely small client footprint, and a modular server-side implementation. such as Oracle and SQLServer. Another Clarens service provides remote access to Globus functionality for non-Globus clients, and includes file transfer, replica catalog access and job scheduling. XML-RPC remote procedure call mechanism. This was chosen both for its simplicity, good degree of standardization, and wide support by almost all programming languages. Communication using SOAP is also available. The modular design of the Clarens server allows functionality to be added to a running server without taking it off-line by way of drop-in components written in Python and/or C++. 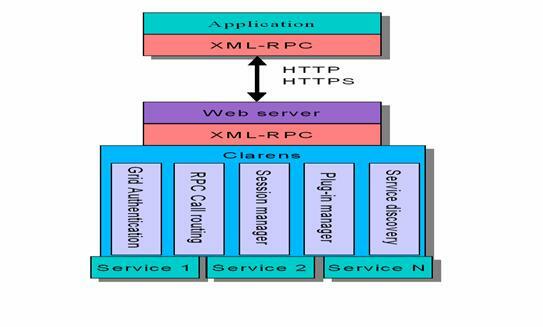 The multi-process model of the underlying Web server (Apache) allows Clarens to handle large numbers of clients as well as long-running client requests. The server processes are protected from other faulty or malicious requests made by other clients since each process runs in its own address space. · The transparent GUI and command-line access to remote ROOT files, via a download service. The CAIGEE “CMS Analysis – an Interactive Grid Enabled Environment” proposal to NSF's ITR program, directly addresses the development of a Grid Enabled Analysis Environment. The proposal describes the development of an interactive Grid-enabled analysis environment for physicists working on the CMS experiment. The environment will be lightweight yet highly functional, and make use of existing and future CMS analysis tools as plug-in components. The CAIGEE architecture is based on a traditional client-server scheme, with one or more inter-communicating servers. A small set of clients is logically associated with each server, the association being based primarily on geographic location. The architecture is “tiered”, in the sense that a server can delegate the execution of one or more of its advertised services to another server in the Grid, which logically would be at the same or a higher level in the Tiered hierarchy. In this way, a client request can be brokered to a server that is better equipped to deal with it than the client’s local server, if necessary. In practice CAIGEE will initially deploy Web Services running on Tier2 regional centers at several US CMS institutions. Each of these servers will be the first point of interaction with the “Front End” clients (local physicist end users) at US CMS sites. The servers will offer a set of Web-based services. This architecture allows the dynamic addition of, or improvement to, services. Also, software clients will always be able to correctly use the services they are configured for. This is a very important feature of CAIGEE from a usability standpoint; it can be contrasted with static protocols between partner software clients, which would make any update or improvement in a large distributed system hard or impossible. Figure 19 The CAIGEE architecture for a Grid-enabled HEP analysis environment. The use of Web Services with thin clients makes the architecture amenable to deployment on a wide range of client devices. Grid-based data analysis requires information and coordination of hundreds to thousands of computers at each of several Grid locations. Any of these computers may be offline for maintenance or repairs. There may also be differences in the computational, storage and memory capabilities of each computer in the Grid. At any point in time, the Grid may be performing analysis activities for tens to hundreds of users while simultaneously doing production runs, all with differing priorities. If a production run is proceeding at high priority, there may not be enough CPUs available for the user’s data analysis activities at a certain location. Due to these complexities, CAIGEE will have facilities that allow the user to pose “what if” scenarios which will guide the user in his/her use of the Grid. An example is the estimation of the time to complete the user’s analysis task at each Grid location. CAIGEE monitoring widgets, with selectable levels of detail, will give the user a “bird’s eye view” of the global Grid system, and show the salient features of the prevailing resources in use and scheduled for the future. CAIGEE will also be interfaced to the MONALISA monitoring system (described in Section 9.5) for more sophisticated decisions, and decision-support. ensemble of facilities, while large by any standard, is less than the physicists require to do their work in an unbridled way. There is thus a need, and a drive to solve the problem of managing global resources in an optimal way, in order to maximize the potential of the major experiments for breakthrough discoveries. and monitored globally end-to-end, and a new mode of "human-Grid" interactions has to be developed and deployed so that the physicists, as well as the Grid system itself, can learn to operate optimally to maximize the workflow through the system. Developing an effective set of tradeoffs between high levels of resource utilization, rapid turnaround time, and matching resource usage profiles to the policy of each scientific collaboration over the long term presents new challenges (new in scale and complexity) for distributed systems. A new scalable Grid agent-based monitoring architecture, a Grid-enabled Data Analysis Environment, and new optimization algorithms coupled to Grid simulations are all under development in the HEP community. Successful construction of network and Grid systems able to serve the global HEP and other scientific communities with data-intensive needs could have wide-ranging effects: on research, industrial and commercial operations. The key is intelligent, resilient, self-aware, and self-forming systems able to support a large volume of robust Terabyte and larger transactions, able to adapt to a changing workload, and capable of matching the use of distributed resources to policies. These systems could provide a strong foundation for managing the large-scale data-intensive operations processes of the largest research organizations, as well as the distributed business processes of multinational corporations in the future. It is also conceivable that the development of the new-generation of systems of this kind could lead to new modes of interaction between people and “persistent information” in their daily lives. Learning to provide and efficiently manage and absorb this information in a persistent, collaborative environment could have a profound transformational effect on society. A great number of people contributed to the work and ideas presented in this chapter. Prominent among these are Richard Mount (SLAC), Paul Messina (Caltech), Laura Perini (INFN/Milan), Paolo Capiluppi (INFN/Bologna), Krzsystof Sliwa (Tufts), Luciano Barone (INFN/Bologna), Paul Avery (Florida), Miron Livny (Wisconsin), Ian Foster (Argonne and Chicago), Carl Kesselman (USC/ISI), Olivier Martin (CERN/IT), Larry Price (Argonne), Ruth Pordes (Fermilab), Lothar Bauerdick (Fermilab), Vicky White (DOE), Alex Szalay (Johns Hopkins), Tom de Fanti (UIC), Fabrizio Gagliardi (CERN/IT), Rob Gardner (Chicago), Les Robertson (CERN/IT), Vincenzo Innocente (CERN/CMS), David Stickland (Princeton), Lucas Taylor (Northeastern), and the members of our Caltech team working on Grids and related issues: Eric Aslakson, Philippe Galvez, Koen Holtman, Saima Iqbal, Iosif Legrand, Sylvain Ravot, Suresh Singh, Edwin Soedarmadji, and Conrad Steenberg. This work has been supported in part by DOE Grants DE-FG03-92-ER40701 and DE-FC03-99ER25410 and by NSF Grants 8002-48195, PHY-0122557 and ACI-96-19020. Continuing the trend of the last decade, where the affordable bandwidth increased by a factor of order 1000.
 http://www.cern.ch/MONARC . This project is described further in Section 4.3 . At the time of this writing, a major Tier1 center in Rio de Janeiro Brazil is being planned. Tier4 also includes laptops, and the large number of handheld devices with broadband connections that are expected to come into use before LHC startup in 2007. At that time, the LHC planning specified a start of machine operations in 2005. The machine is now expected to come online in 2007. The Sloan Digital Sky Survey (SDSS) will digitally map about half of the northern sky in five filter bands from UV to the near IR. SDSS is one of the first large physics experiments to design an archival system to simplify the process of “data mining” and shield researchers from the need to interact directly with any underlying complex architecture. Mathematics, Information and Computer Sciences, through the SCIDAC (Scientific Discovery through Advanced Computing) initiative. One of the two PACI programs, led by the San Diego Supercomputer Center. An initial approach to this optimization procedure is introduced in Section 8.5 .. While quite different in detail, this has many structural similarities to multinational corporations. Hence the conjecture that the solution to HEP’s largest Grid-related problems will have broad applicability to industry and eventually commerce. See Chapter 4, Anatomy of the Grid, Figure 2 and Section 4.4. Alternatively, the Grid layers given in this list could be considered as part of a “thick” Collective layer. Six to eight years before startup in the case of the LHC experiments. Specifically many of the major HEP experiments forsee using the Open Grid Services Architecture (OGSA) described in Chapter 5, as the services are deployed and made production ready. Given the current and upcoming milestones, the strategy employed is likely to consist of two steps: (1) deploying and testing a fully functional one-off integrated system developed by an HEP experiment or Grid project, and then (2) doing a progressive “sideways migration” towards the OGSA. It is interesting to speculate, for the long term, that a 100 Tbyte transaction completed in 10 minutes corresponds to 1.3 Tbps. If we consider this as a requirement 10 years from now, this will be well below the capacity of a fiber, but perhaps (roughly) equal to the I/O capability of the largest disk systems of the time (approximately 5 years after the start of LHC operations). It is not possible to guess whether the bandwidth, routing and switching equipment to do this will be affordable within the next 10 years. “Dark Fiber” refers to otherwise unused optical fiber that the customer purchases or leases for long periods, and provides for the optical transmission and multiplexing/switching equipment himself. Shared by the TeraGrid (see http://www.teragrid.org), the Caltech campus and Caltech HEP. See for example the PPDG CS-9 Project Activity on Site Authentication, Authorization and Accounting (AAA) at http://www.ppdg.net , or the DataGrid WP7 Security Coordination Group (SCG). Several dynamic services on each Station Server, managed with a scheduling engine at each site. As discussed in this section, the example scheduling service shown here is targeted at very large scale heterogeneous systems distributed over many sites. It is meant to be complementary to other local and distributed scheduling systems (such as Condor) which have more sophisticated job queue management features, and to intercommunicate with those systems. Finding the path with the maximum predicted throughput through a distributed system. Submitted by Caltech together with UCSD, UC Davis and UC Riverside in February 2002, and now funded for the first year. A proposal to complete the funding is planned for 2003. [ ] See www.cern.ch/LHC . [ ] See http://www.datatag.org . [ ] The new academic and research network in Japan that started in January 2002. See for example http://www.japan-telecom.co.jp/PRdept/NEWSLETTER_Eng/nl13/update2.html . [ ] S. Ravot and J.P. Martin-Flatin, “TCP Congestion Control in Long-Distance Networks”, submitted to InfoComm 2003. [] Simulation Studies in Data Replication Strategies, CHEP2001, Beijing 2001. See http://clegrand.home.cern.ch/clegrand/CHEP01/chep01-10-048.pdf and http://www.cern.ch/MONARC/sim_tool/Publish/CMS . [ ] H.B. Newman and I.C. Legrand, A Self-Organizing Neural Network for Job Scheduling in Distributed Systems, CMS Note 2001/009. See http://clegrand.home.cern.ch/clegrand/note01_009.pdf . [ ] MONALISA is currently interfaced to Ganglia (http://ganglia.sourceforge.net/ )and MRTG (http://mrtg.hdl.com/mrtg.html ). It will be interfaced to MDS2 (see http://www.globus.org ) and Hawkeye (see http://www.cs.wisc.edu/condor/hawkeye/ ) in the near future. [] Such as PBS (see http://www.openpbs.org/ ) and LSF (see http://www.platform.com/products/wm/LSF/index.asp ). These interfaces will be implemented in the near future. [ ] Universal Description, Discovery and Integration, a “meta-service” for discovering Web Services.